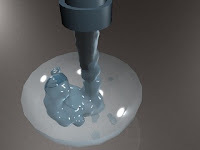 This project is implemented particle-based approach using SPH technique to simulate fluids with free surfaces. We derive the viscosity and pressure force fields from Navier stokes equation and added a term to model surface tension effects. For interactivity purpose, we used smoothing kernels proposed in paper Particle Based Fluid Simulation for interactive application by Matthias Müller, David Charypar and Markus Gross. Then we used these particles to render the surface of the fluid using the marching cube based surface reconstruction method. We are able to simulate nearly 4000 particles at interactive rates. However, fluid surface construction takes a very long time. SPH is an interpolation method for particle systems where each field quantity is calculated at discrete particle location. These particles have a spatial distance known as the "smoothing radius", represented by h in equations, over which SPH distributes the quantities using kernel function. Hence, we can get the value of any physical by summing the relevant properties of all the particles which lie within the range of the kernel. The function W (r, h) is called the smoothing kernel with core radius h.
g is an external force density field and µ the viscosity of the fluid. is the rest density to calculate the pressure. However, in this case we symmetrize the viscosity using velocity differences. We check the intersection of particle with the boundaries of the container at the time of calculating velocity derivative. If the particle is colliding with the container surface, we calculate the normal of the surface. Then , we simply reflect the velocity component of the particle by multyplying it with the normal. These boundaries were implemented by using particle-cube intersection, particle-circle intersection, particle-sphere intersection.We additionally implemented arbitrary boundaries using particle-polygon intersection. But the method we described above is not handling the arbitrary boundaries efficiently. Hence, we have disabled that functionality from our application and plan to implement it as a part of future implementation. for the calculation of surface tension. We have used leap frog integration scheme for derivative calculation. We started by initializing a fixed grid based on the min and max boundary conditions for each scene. Then, we identified the cells which contained the surface using the distance between the particle position and grid minimum boundary. During simulation step, we search for all the cells that contain surface particles and for each cell identified to contain the surface, the triangles are generated. We update the grid at each simulation step to identify the cell containing the surface. Standalone C++ and opengl application. 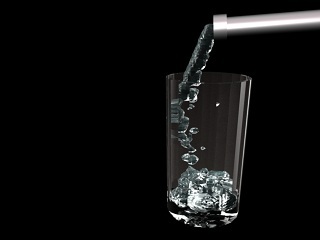 Maya Plugin for the fluid simulation. The details of our plugin and opengl application are provided here. Particle-Based Fluid Simulation for Interactive Applications. JMatthias Müller, David Charypar and Markus Gross.